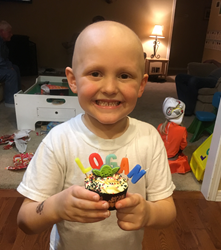 Cliff Hart Agencies, a full service insurance company with clients throughout the central and eastern Michigan regions, is continuing a charity project started several months ago to benefit the family of Logan Sweet, a young Michigan native diagnosed with T-Cell Acute Lymphoblastic Leukemia. Logan’s parents, Ryan and Krystal, have traveled to be with their son at Motts Children’s Hospital in Ann Arbor, and the charity drive initiated by Cliff Hart Agencies is meant to alleviate financial concerns and allow the Sweet family to remain together throughout Logan’s treatment period. The Sweet family is also hoping for the thoughts and prayers of other families in nearby communities. “We’ve already received a great deal of support for the Sweet family from communities throughout Michigan, but we need just a bit more help to see them through this difficult time,” says Cliff Hart, founder and manager of Cliff Hart Agencies. The Cliff Hart team has been reaching out to communities across the state over the last two months in an effort to raise donations for the Sweet family. The team has built an online social media portal and established a state-wide email update bulletin to share Logan’s story. A recent full page article in the firm’s monthly online magazine “Our Hometown” proved successful, and another article is planned for release soon: http://www.cliffhartagencies.com/Our-Hometown-Magazine_41. Assisting the Sweet family is the latest charitable mission of Cliff Hart Agencies, but it certainly won’t be the last. As part of a permanent community involvement campaign, Cliff Hart Agencies will be selecting and supporting a new Michigan-based charity or non-profit every sixty days in the months to come. Readers interested in joining the Sweet Family charity drive and assisting the Cliff Hart team are invited to stop by the following page and make a personal contribution to the cause: http://www.cliffhartagencies.com/Let’s-Help-Little-Logan-Fight-Against-Leukemia_18_community_cause. Readers that wish to learn more about other charities supported by Cliff Hart Agencies can browse the firm’s Community Causes list here: http://www.cliffhartagencies.com/community-cause.